Forces, acting on an anti-slide pile, are provided by the slope stability analysis. Calculation of slope stability SF is based on the equilibrium analysis of forces acting on blocks of soil above the slip surface. Vertical surfaces of individual blocks are subjected to action inter-block forces Fi and their determination is one of the steps of the slope stability analysis. If the soil blocks are exactly in the state of limit equilibrium, the inter-block forces at the beginning and at the end of the slip surface are equal to zero. 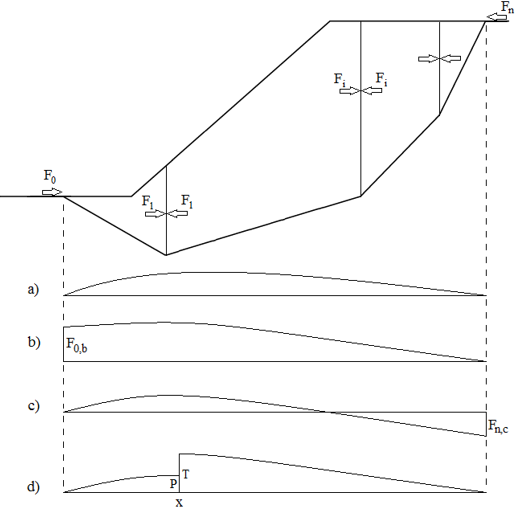 The limit factor of safety SFlim, for which the state of limit equilibrium is reached, is considered as a real factor of safety on an input slip surface. The distribution of inter-block forces along the sliding length is called the pressure line. The forces acting on an anti-slide pile are determined from the distribution of pressure lines calculated for the required factor of safety SFs. The following figure shows different distributions of inter-block forces Fi (pressure lines). Graph a) displays the distribution of forces Fi in the state of limit equilibrium, where zero values of inter-block forces are found both at the beginning and at the end of the distribution. It means that this state has been found for the value of factor of safety SFlim, which exactly expresses the degree of safety on a input slip surface. Graph b) displays the pressure line determined for a higher factor of safety than the one corresponding to SFlim. An assumption of zero force Fn is adopted at the top of the slip surface and a non-zero force F0,b at the bottom of the slip surface is subsequently recorded. This means that in order to arrive at the factor of safety SF, the base of the slope would have to be loaded by the pressure force having the value of F0,b. Graph c) displays the pressure line for a factor of safety SF greater than SFlim. It results from the assumption of a zero force F0 on the bottom end of the slip surface at the top and then an unbalanced force Fn,c is encountered. Arriving at the state of equilibrium for the factor of safety SF would thus theoretically call for the action of a tensile force of this magnitude at the top end of the slip surface. Graf d) shows a distribution of inter-block forces for the case when an anti-slide pile is placed at point x. Part of the distribution corresponds to graph c) and serves to determine the magnitude of passive force P at point x. Above the pile the distribution according to graph b) is considered and serves to determine the active force T at point x. The difference between P and T is the force transmitted by the anti-slide pile.